And learn the Bear's stars well. Located in the constellation Ursa Major and within the bowl of the big dipper, lies the semiregular variable Z Ursae Majoris. Z UMa captivates the attention of many because it is easy to find in a constellation that is friendly to northern sky observers. Its semiregular periodicity is exciting to follow and results from several different pulsation periods within the star! This variable is perfect for beginning observers to locate and monitor, and it is bright enough to be followed in small telescopes or binoculars. Dr. E.S. King, of the Harvard College Observatory, discovered the variable Z Ursae Majoris in 1904 due in large part to its peculiar spectrum. Z UMa's spectrum reveals delta and gamma hydrogen lines in emission and the presence of peculiar molecular absorption bands such as TiO (titanium oxide). Once inspired, Dr. King had the star looked up on photographs in the Harvard collection, and on 22 Draper Memorial plates taken between the years 1897 and 1904. This led him to discover that Z UMa was a variable star with a magnitude range of at least 1.5 magnitudes. The AAVSO historical light curve of Z UMa shows that the mean magnitude range truly varies over time. Currently the mean range appears to vary from 7.2 to 8.9 magnitudes. However, in the General Catalogue of Variable Stars (GCVS) Z UMa is recorded to vary in brightness from its faintest minimum magnitude of 9.4 to its brightest maximum magnitude of 6.2. 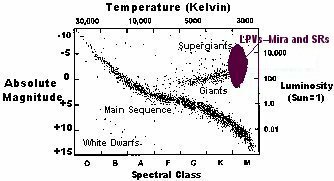 The GCVS classifies Z UMa as a semiregular variable (SR) of subtype B. SRB stars are late type giant stars with an M, C, or S spectrum and poorly defined periodicity or alternating intervals of slow irregular changes. In the case of Z UMa, the spectrum is M5IIIE (a cool red giant spectrum with molecular bands and emission lines), and the mean period is 195.5 days. This is the mean period of the star, but the light curve indicates that there is more than just one pulsation period for Z UMa. Observational evidence suggests that Z UMa has more than just one pulsation cycle, in fact it is thought that the star pulsates in high modes and that beat and resonance phenomena occur within the star. Michael K. Suchko (1980), a former AAVSO summer assistant who analysed AAVSO observations, suggests that Z UMa has two periods; one primary period of 195.5 days (the current mean period listed in the GCVS) and a second poorly defined period of about 205 days. He suggests that these two periods are beating with each other to produce another beat with a period of 4200 days. Isles (1998) also indicates that the irregularities seen in the light curve of Z UMa are the result of the superposition of several different pulsation cycles within the star. These multi-periodicities can be seen in the AAVSO historical light curve which displays data from 1934 to 2000. Both images indicate the variable Z UMa by a red arrow and a 5.9 magnitude star by a yellow arrow. 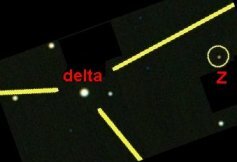 The bright star in the upper left corner of the images is delta UMa and helps locate the variable Z UMa. The image on the left shows Z UMa at minimum on April 5, 1995 JD 2449812.65, and is indicated by the first red line on the light curve below. The image on the right shows Z UMa at maximum on April 28, 1995 JD 2449835.73 and is indicated by the second red line on the curve below. The light curve of Z UMa from March 1994 to December 1998. Each point is a one-day mean of amateurs' visual observations from the AAVSO International Database. Tick marks occur approximately every 195.5 days to show the mean period. The first red line marks the point in time that the above left image was taken, the second red line indicates the time of the above right image. The Research teams of L.L. Kiss (1999) and Percy and Polano (1998) suggest that multiple periodicities of Z UMa result from simultaneous pulsations of excited modes within the star. They indicate that Z UMa may be pulsating in the fundamental mode, the first, and even higher overtones of pulsation at the same time. Another researcher, Barnbaum (1995), proposes that mechanisms other than pulsation may drive the irregular light curve: mechanisms such as the presence of a stellar companion, distorted stellar shapes, rotation, or star spots. Can You Find Z UMa? Many veteran variable star observers began their careers by observing Z UMa, so we invite you to give it a try also. 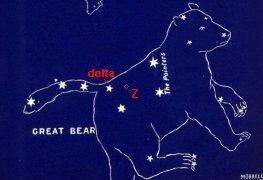 Z UMa glows pale orange in the northern circumpolar constellation, The Big Dipper or The Plow, and is especially easy to find this month. Unlike many other semiregular variables whose magnitude range is usually very small thus not very suitable for visual observing, this red giant varies its light output by close to two magnitudes. With Z UMa in the field, make an estimate of its brightness by comparing the variable to comparison stars in the surrounding area. Once you have made your observation, you may submit it to the AAVSO International Database to be incorporated into a permanent long-term light curve for Z UMa. For more information on this process, visit our WebObs page. A detailed description of the magnitude estimating process can be found in section 8.1 "How to estimate a variable: Z Ursae Majoris and the AAVSO method", of the book entitled Observing Variable Stars: A Guide for the Beginner by David Levy, January 1998. Also, look for more information on variable star observing in the AAVSO Manual for Visual Observing of Variable Stars. When observing red variable stars, such as Z Uma, make your magnitude estimate with a quick glance rather than with a prolonged stare. Red stars tend to excite the retina more than blue stars when they are viewed for a long time, making the red stars appear brighter than they are (Purkinje effect). Z Ursae Majoris is a semiregular variable. Semiregular variables are post main sequence cool (red) giant and supergiant stars. They are classified as long period variables (LPVs), commonly called red variables, and occupy a distinct zone in the far-right region of the Hertzprung-Russel diagram. The long period variables are classified into three categories: Mira (M), semiregular (SR), and slow irregular (L) variables. The Mira variables are the most well-defined and homogeneous subgroup. They have periods longer than 60 days, amplitudes in the visual larger than 2.5 magnitudes, and show rather periodic variability. 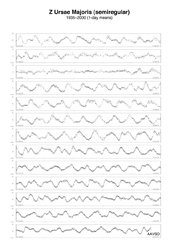 The SR variables are a subgroup that have smaller than 2.5 magnitude amplitudes and show significant inhomogeneity in their division into SRA which have periods longer than 35 days, with periodic variability, and SRB (like Z UMa) which have periods longer than 20 days, and less periodicity in their light variation. Further divisions include the SRC types, which are more luminous and the the SRD types, which are warmer variables. The slow irregular variables (L) are a subgroup that shows light variations with no evidence of periodicity, or any periodicity that is present is poorly defined or appears only occasionally. The long period variables of low and intermediate mass red giants (like Z UMa) located in the area of the HR diagram called the Asymptotic Giant Branch (AGB) are critical to our understanding of stellar evolution because they represent the final stages of stellar life. Observations of these stars reveal significant pulsational behaviour that advances our knowledge of the physical processes taking place within these evolved stars. It is observed that, through their pulsations, these stars lose significant amounts of mass and thus are primary sources for the enrichment of the interstellar material. Continued observations of these stars are important in understanding their long term behavior, and correlating theories of stellar pulsation and stellar evolution. Barnbaum, Cecilia; Morris, Mark; Kahane, Claudine; Astrophysical Journal v.450, 1995, p.862. Isles, John E. "Big Dipper Variables", Sky and Telescope, June 1998, pp 98-100. Kiss, L.L., K. Szatmary, R.R. Cadmus Jr., J.A. Mattei, "Multiperiodicity in semiregular variables", Astronomy and Astrophysics, v.346, 1999, pp 542-555. Levy, David H. Observing Variable Stars: A Guide for the beginner, Cambridge University Press, January 1998. Mattei, J.A., Foster,G., et al. "Classification of Red Variables", Proceedings of the ESA Symposium Hipparcos-Venice '97, 13-16 May, Venice, Italy, July 1997, pp 269-274. 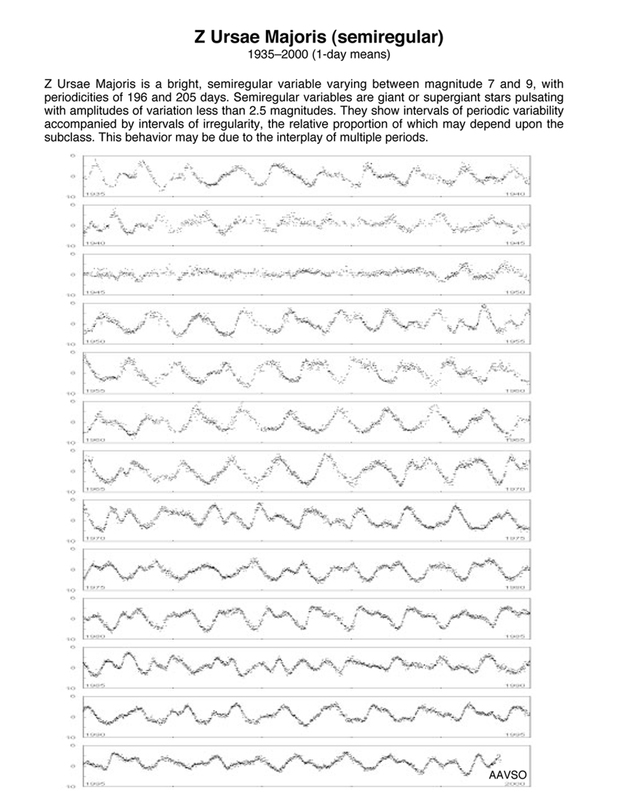 Percy, John R., Polano, S. "Pulsation Modes in M Giants", ASP Conference Series, Vol. 135, 1998, pp 249-253. Suchko, Michael K. "The Periodicities of Z Ursae Majoris", The Journal of the AAVSO, vol.9, No.2, 1980, pp 74-80.